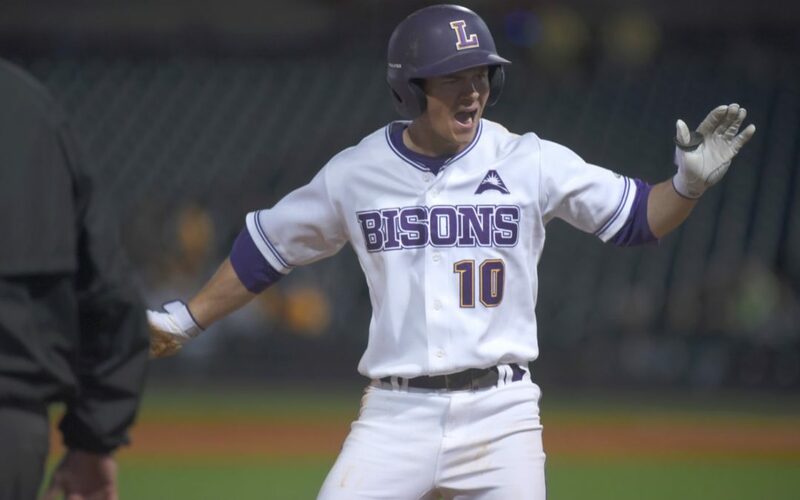 Lipscomb took down the eighth-best college baseball team in the country Tuesday night. In a neutral-site game played at the minor-league First Tennessee Park, the Bisons (11-13) used a three-run triple and impeccable bullpen pitching to take down the No. 8 Vanderbilt Commodores (17-9) by a final score of 5-1. The three-run hit in the fifth, courtesy of junior first-baseman Cade Sorrells, propelled Lipscomb headfirst towards victory, but there were other small details that helped Lipscomb keep momentum in their favor as well. In the third inning, junior left-fielder Tevin Symonette jumped and bounced off of the fence while he caught a fly ball to help keep the game tied at zero. “I think it helped us set the tempo of how the game was going to go,” Forehand said of the catch. Starting junior pitcher Kyle Kemp put in an odd performance for Lipscomb in four innings. On one end, he allowed no hits, struck out three, and allowed one run on a sacrifice fly. On the flipside, he posted seven walks, dragging innings out much longer than they needed to go. The Commodores took a 1-0 lead in the top of the fourth on a sacrifice fly from junior first baseman Julian Infante, which sent junior outfielder Walker Grisanti home from third. Lipscomb responded in the bottom of the fourth with a leftward home run by junior third baseman Zeke Dodson. The game score stood at 1-1. The Bisons became electric in the bottom of the fifth. Sorrells’s crucial three-run hit gave the Bisons the 4-1 lead. The right-of-center hit sailed out of the way of the Commodore outfielders, allowing ample time for the bases to unload. Sorrells extended Lipscomb’s lead when he ran home from third on a Dodson flyout. The inning ended with Lipscomb leading 5-1. The Bisons pitching staff allowed one hit in total. The bullpen was responsible for two walks and seven strikeouts. Home plate umpire Michael Thomas had to take a quick game-pausing break after being hit in what looked like his head in the bottom of the fifth. Nearly 1500 fans attended the game. Nashville Sounds staffers and cheerleaders were present, and some food and drink concessions were open for use. Lipscomb plays at home against NJIT on Thursday at 6 p.m. to begin a three-game conference opener.